Abbott Antiques has amethyst purple glass for sale at 413 W. Main St. Customers often ask us why we do not have more old purple bottles. The truth is the old purple glass bottles are getting harder and harder to find. it has been more than 100 years since glass was manufactured with manganese. American glass companies used manganese from around 1860 to the mid 1910s. Then the glass has to be exposed to sunlight for many years. Eventually the glass turns purple. 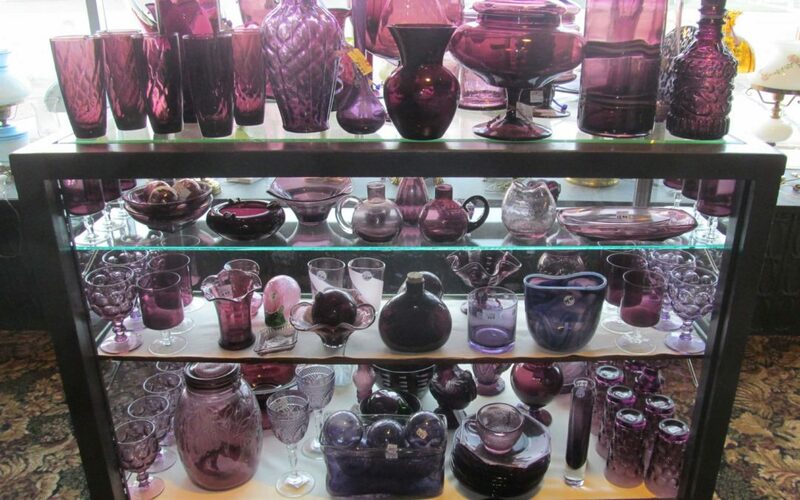 We had trouble finding enough purple tinted glass bottles. Around 10 years ago we started buying all the quality amethyst and purple glass we could find. Today, we attempt to satisfy customer requests for lavender, violet, royal purple and the other 50 shades of purple glass. Abbott Antiques has a few purple slag glass items on hand including one hard to find cruet. Abbott also has mid century modern purple encased Italian ash trays and candy dishes. Abbott has the purple Ball jars in both quart and pint size on hand. If purple glass is your passion please make an appointment to see Abbott’s offerings. May 1 to Nov. 1 Abbott is open every Saturday. We have purple items throughout the store in addition to the pictured showcase located at the front of the buidling.